This cat tree has been up for about a week and it is already falling apart. Refund requested. The mice fell off within a day and my kitten is only 2lbs. The actual condo part is quite small as well. Our cats absolutely love this tree! It is pretty good for the price. 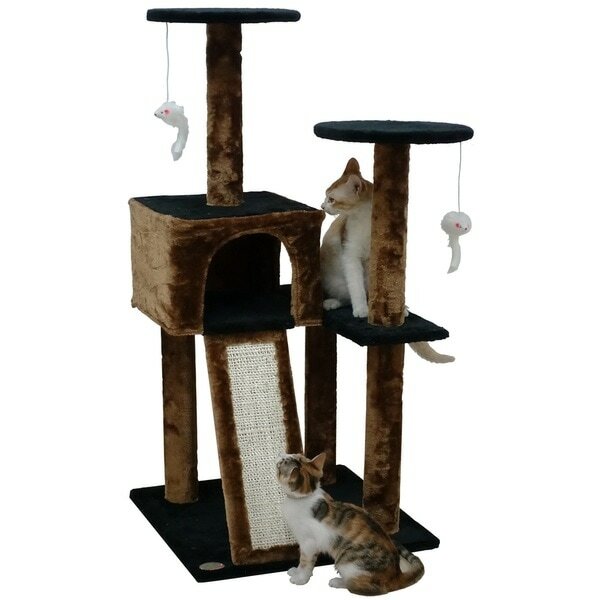 Worry about how well it will handle over time as the scratching post is coming loose from the square. This was a bit tricky to put together but before we could even finish my cat was all over it. Once it got assembled I was very pleased with the look and the quality. It also came fairly quick. My cats of which there are 3 have a great time playing on this. We'll worth the money. Delivery was quick. Thanks Overstock. Cats love it but a little small for big cats. Because i adopted a cat ..and i think she deserves something special.